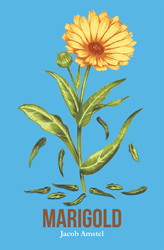 Recent release “Marigold,” from Page Publishing author Jacob Amstel, is a riveting story of love, life, and growing up. Jacob Amstel, a passionate writer has completed his new book “Marigold”: a potent story that allows the author’s voice to resonate with his readers on a deeply personal level, which serves as an invitation to the world as seen through his eyes and heart. Jacob Amstel resides in Lakewood, a suburb of Cleveland, Ohio. Previously, Jacob has displayed his passion for writing by creating short stories, scripts, sports articles, and editorial pieces. Jacob mixes real life experiences with original thoughts, humor, and honest emotions to give his readers a raw, authentic glimpse into the personality which fuels his literary talent. Published by New York City-based Page Publishing, Jacob Amstel’s poignant tale is the author’s interpretation of how to write your own ending. “This starts the new chapter of your life" is a phrase that Brady hears daily during his senior year of college. The voice in his head keeps reminding him that he still has to write his own ending. The past chapters were called "High School" and then "Coming Out" but this chapter doesn't have a title, or even a beginning. Just failed relationships and boys breaking his heart. This all changes when he meets a smart, funny, kind, confident, but human boy named Aiden. Brady tries to silent the voice in his head as he falls for Aiden. The relationship blossoms even though Brady finds out Aiden has a boyfriend. At the conclusion of senior year the chapter is mostly written with Aiden being the main focus. Decisions after graduation make for a few possible endings. Brady tries to write his own, but with every look from Aiden, he starts to relinquish the keyboard. Readers who wish to experience this mesmerizing work can purchase“Marigold” at bookstores everywhere, or online at the Apple iTunes store, Amazon, Google Play or Barnes and Noble.